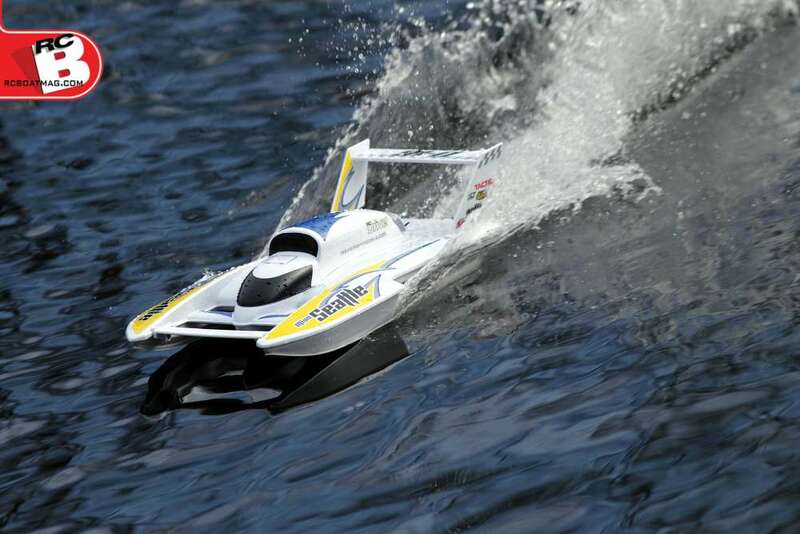 In full-scale boat racing there is nothing like the excitement and adrenaline pumping action that you feel when watching Unlimited Hydroplane Racing. These extreme machines fly across the water at incredible speeds with the hull barely skimming the surface of the water…as if part boat and part airplane. 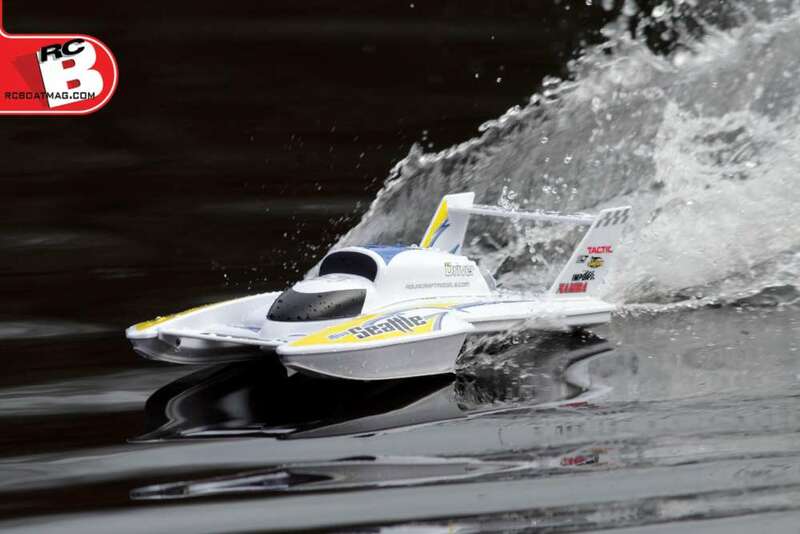 Aquacraft recently introduced their Miss Seattle Brushless Unlimited Hydroplane in a RTR (Ready-To-Run) form that comes complete with everything you need to get in on the high-speed action at your local pond. You just need to supply your favor- ite battery pack and you are ready to go. Who says heart-pumping RC action has to cost a fortune? The Miss Seattle packs a serious punch for less than 180 bucks. 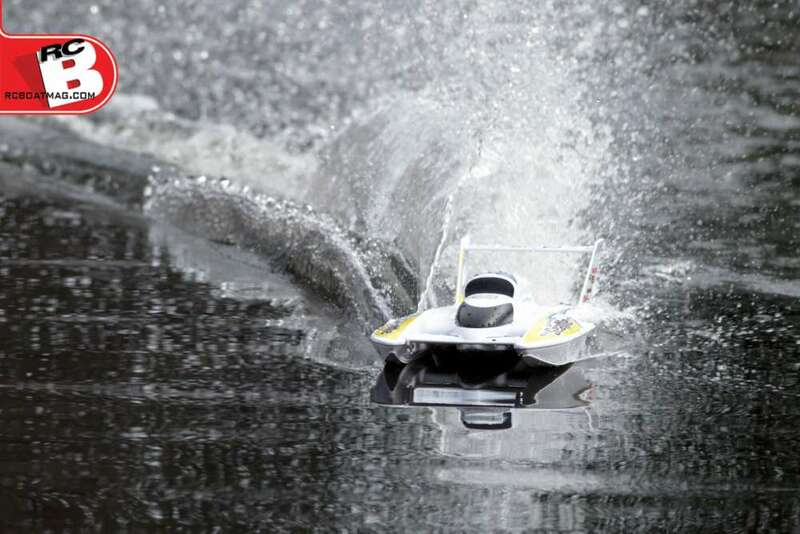 It features a performance-engineered ABS hull, a powerful 2200Kv inrunner water- cooled brushless motor that is driven by a water-cooled 30A ESC. The included Tactic TTX300 2.4GHz radio system completes the RTR package with more than enough performance to turn heads and lap your competition. The Miss Seattle is not a lazy Sunday ride on the water, but rather it is a screamer that will hit speeds you might not expect from such a small watercraft. The high performance hull combined with the brushless power system rockets through the water barely skimming the surface. The steering system combined with the adjust- able turn fin allows the Miss Seattle to make tight high- speed turns with little stress on the driver. It is a durable design with a lot of performance for the price. The Miss Seattle promises a lot of performance on the water, so I could not wait to unleash it on my local pond and see what it is made of. Fortunately my pond is a good size and is sheltered on all sides from wind so the water tends to be very flat… perfect for a little hydro. I loaded a fully charged battery into the hull, sealed the hatch with the included tape and then placed it on the water. As I punched the throttle, the Miss Seattle launched like a rocket, skimming the surface of the water. I was impressed that it did not capitate at all. Many times smaller boats like this with a surface drive power system will require you to hand launch with power applied. Make no mistake; the Miss Seattle was designed for racing. The offset rudder and star- board-mounted turn fin means that it will have superior turning capability in right-hand turns. Consequently it will not turn very well at all to the left and will most likely end with you flip- ping the boat if you have the power on to high. Since races are “go fast, turn right” the Miss Seattle provides amazing handling even at higher speeds in the turns. As long as the water is flat, you can power through turns without stress. However, in choppier water, the Miss Seattle will keep you on your toes. The small hull size combined with gobs of power makes it a handful in the chop…so much so that it goes from being a blast to drive to not fun at all. In the straightaway, the Miss Seattle is a screamer, kicking up an impressive rooster tail and riding on air, just touching the water’s sur- face. The speed was high but manageable. I was seeing runs of anywhere from 7 to 11 minutes depending on throttle management using the ElectriFly battery pack. The Miss Seattle has on overall length of 18 inches and comes completely assembled and ready to run. You only need to supply your favorite 1000mAh 3S LiPo battery and char- ger to take in the action. The ready-to-run design allows you to get to the water faster without a lot of pre-run chores. A water- cooled 2200Kv brushless in runner motor with a 30A ESC generates tons of power for some very high-speed action on the water. The Miss Seattle is controlled by a two-channel, 2.4GHz fully proportional Tactic TTX300 radio system. 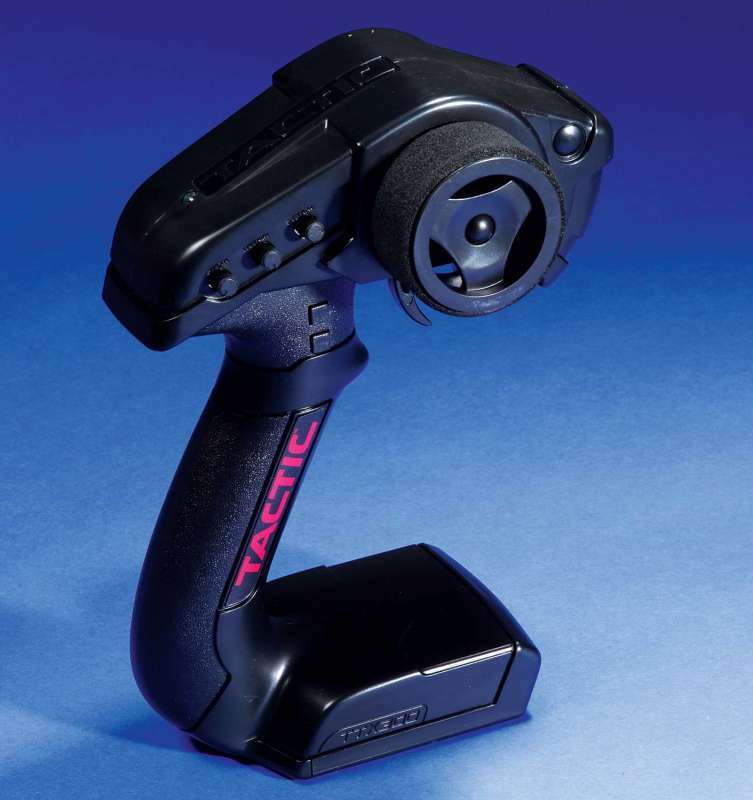 The radio features a comfort- able grip design, throttle and steering revers- ing, trim dials for both channels and a steer- ing rate adjustment knob which is a must for high-speed racing as it can be set to prevent over-steering. The lightweight Tactic TR325 receiver comes preinstalled in the hull with a watertight balloon wrapped around it. Powering the Miss Seattle is a 2200Kv water-cooled brushless inrunner motor. The water-cooling jacket is CNC machined from aluminum and anodized gold. 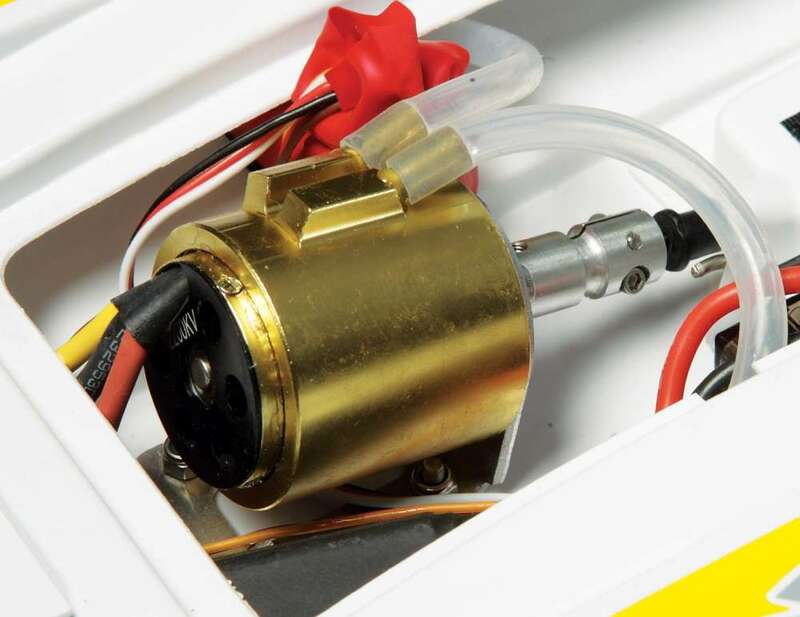 Driving the motor is a water-cooled, LiPo-ready brushless 30 amp ESC with an integrated low battery warning system and a battery cutoff circuit. A water pickup is attached just behind the sponson on the right side of the hull. The motor uses a pinch wire coupler to connect to the music wire drive shaft. The ESC comes equipped with a Deans connector which is ready for a 3S 1000mAh LiPo of your choice. A mini servo is mounted inside the hull with a push wire extending though a rubber boot in the hull before attaching to the rudder. The high-performance ABS hull measures in at 18 inches overall. It features lightweight construction to maximize high-speed perfor- mance. Removing the two-piece hatch gives you full access to the hull’s interior. The sim- ulated motor shroud is locked in place in the front and uses a metal body clip at the rear to hold it in place. Below that is the square-cut hatch opening, which allows for easy applica- tion hatch tape. Hatch tape is a necessity on larger boats and it is my only negative on the Miss Seattle. With the boat being so small it would have been nicer if they had a self-seal- ing hatch…but that is more of my personal opinion. Finishing off the hull is a set of great looking pre-applied Miss Seattle graphics. The transom houses an adjustable motor strut which is connected to the brass stuffing tube extending through the bottom of the hull. 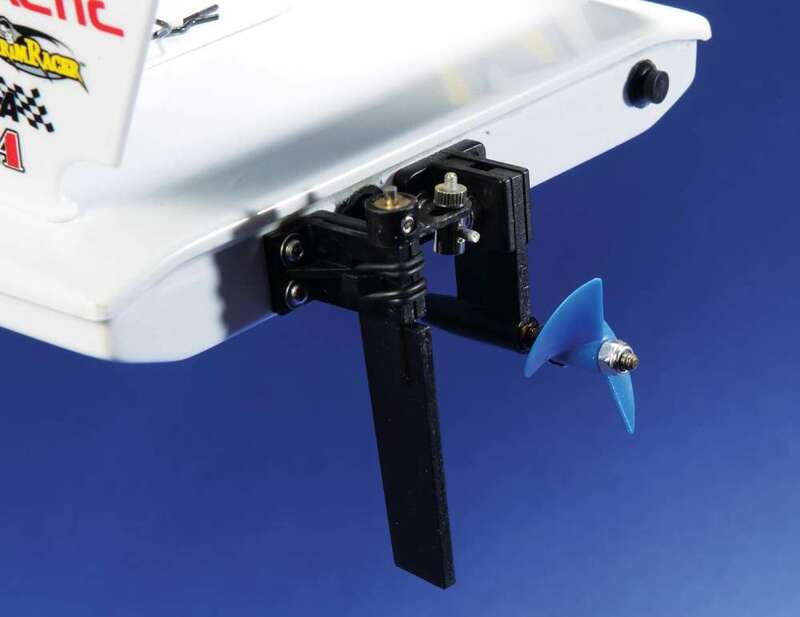 The strut can be adjusted to obtain the best angle of attack for the rudder depending on the water conditions. At the end of the tube is a two-blade 30mm FRP propeller. A plastic break-away rudder system is offset to the left of the prop. 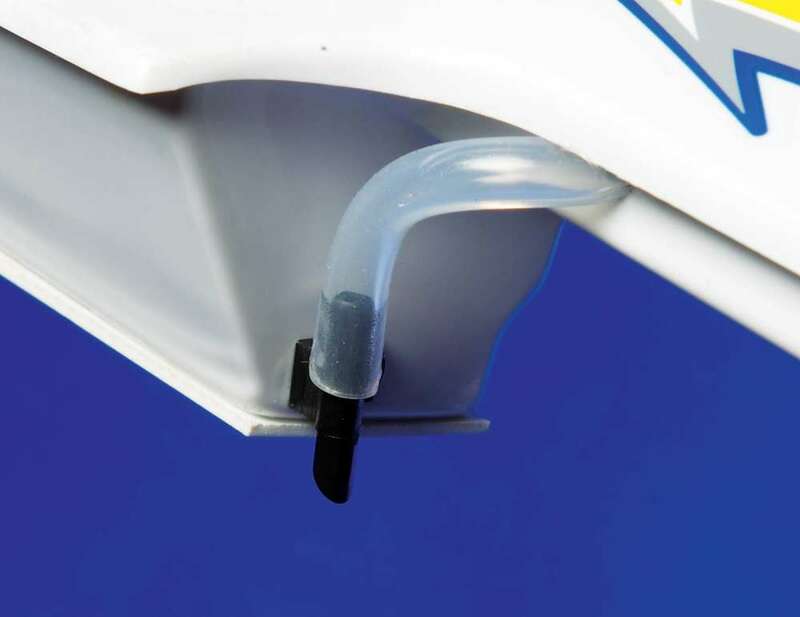 It uses two rubber O-rings that are designed to break in the event the rudder comes in contact with something hard in the water, thus saving it and damage to the transom. A drain plug is located on the lower right side of the tran- som. Finishing off the hull is an adjustable turn fin that is attached to the back of the right sponson. This fin is responsible for the amazing turn capabilities of the Miss Seattle. The Miss Seattle does not come with a battery, so you will have to provide your own 3S 1000mAh LiPo. We used an ElectriFly LiPo, which provided excellent performance and came with a Deans connector to match the ESC. In addition, you will need to provide four “AA” batteries for the transmitter and a charger to match your battery pack. A nice ABS display stand is included for your hydro to rest when not on the water. Tactic’s new TTX300 radio comes with the boat, it has a comfortable feel and all the basic functions you’ll need for this boat. ABS display stand is included for your hydro to rest when not on the water. The water pick-up is located behind the sponson to feed the cooling jacket. Rubber O-rings secure the rudder and allow it to swing back if the rudder hits an object. An aluminum water jacket keeps the 2200Kv motor temper- atures in check. The Aquacraft Miss Seattle is a little rocket ship, delivering tons of performance at an affordable price. The construction is very durable and lightweight and the power sys- tem delivers the goods. The turn control around a race circuit was impressive, being able to maintain a high rate of speed while still staying locked-in to the course. The Miss Seattle is an impressive mini hydro.